Chester practical test centre can be found in the Dunkirk Trading Estate, a few miles to the north of the city centre. Based out of Telford Court, the test centre is a popular option for learner drivers based in and around Chester. We always advise learners to get to know the test centre they're taking their practical at, which is why we've put together test centre guides. Read on directions, pass rates, test routes and much more about Chester. Located around 5 minutes away from the small village of Capenhurst, Chester test centre is just off the A5117. It's easy enough for learners to find the test centre. If you've not had the chance to look around yet, however, just follow the directions here. Please note that the centre does not provide parking, your instructor, however, will tell you where to park on the day of your test. Chester test centre was carefully chosen to ensure examiners would have a mixed variety of road conditions to test candidates on. With its location in a busy industrial estate—and in the vicinity of the bustling A5117—candidates will be made to tackle ever-changing streams of traffic. The more rural areas that are found further from the centre are ideal for testing skills in manoeuvres and much more. Want to know more about Chester? Take a peek at the resources below! Looking for your exact test route? The DVSA no longer publishes test routes. Before you start panicking, relax! You can still look at which roads might show up on your test by checking out videos of Chester test routes on YouTube or by downloading our sample Chester driving test routes. Your lessons with a local instructor will also have prepared you for what's ahead. In fact, your instructor will have introduced you to most—if not all—of the roads that will crop up on your test, including the A5117 and A550. 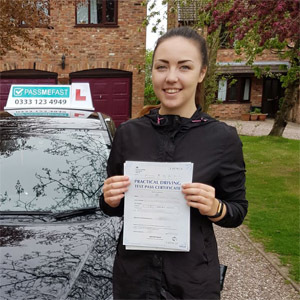 If you’ve spent a bit of time researching into learning to drive, you might have stumbled upon the wonder that is driving test pass rates. In case you didn’t already know, the national average pass rate currently stands at 47%. This stands almost the same for learners in the North West who have a 47.3% chance of passing. What about Chester test centre? As you can see, Chester’s pass rates have been skirting just above and below the national average in recent years. While they’re not the worst pass rates, we can see why you might be slightly disappointed—it is lower than the national average, after all. Before you start panicking, just think about how you’ve progressed in your lessons. If you get into a car and you’re 100% confident with your manoeuvres and overall driving ability, you shouldn’t have anything to worry about. What If I Can't Go To Chester? Chester’s not the only practical test centre you can head to in Cheshire. The nearest alternate centre is Widnes. Alternatively, you can look towards Merseyside with Garston Speke. Hate sitting around waiting for results? Lucky for you: you can get your driving test results as soon as you finish. The examiner will give you a feedback sheet containing any faults you might have made, along with additional verbal comments. If you pass, you'll also receive your very own test pass certificate. Not got the best track record with tests? That’s fine—plenty of people need a few tries to pass their driving test. It’s certainly not something to be embarrassed about. All you’ve got to do is learn from your mistakes and iron out your bad habits in time for your next practical. If you're looking to rebook, PassMeFast can get you a new test in no time—with a refresher course, if necessary. Simply call us on 0333 123 4949 or contact us via our website to get started. Many people make the mistake of learning to drive in single lessons that take place weeks apart. This format of learning can take months—not ideal for learners looking to get on the road as soon as possible. If you find yourself nodding along, you might want to look towards PassMeFast’s intensive or semi-intensive courses—you’ll be on the road in the Chester area in a matter of weeks or even days! With PassMeFast, the road to driving doesn’t have to be long. Book a course online after checking out our course prices or give us a quick ring on 0333 123 4949 and you could be joining our top favourite pass photos in no time! I can’t fault it. Best thing about using a company like this is that you don’t feel like they’re trying to rinse you for your money, as I did with my past instructor! Many thanks to Stuart and PassMeFast!